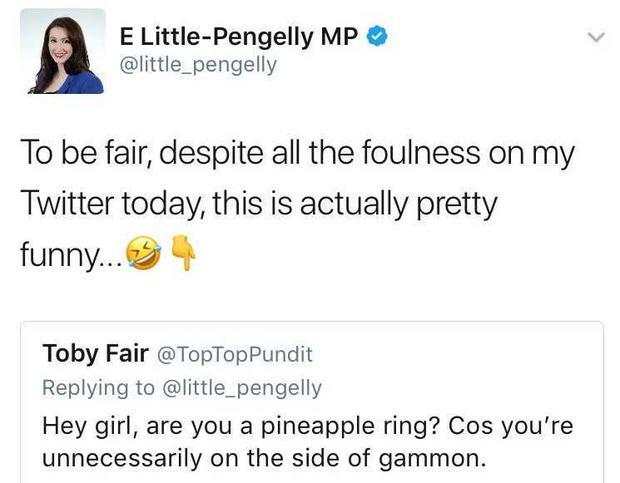 MP Emma Little Pengelly has hit out at the use of the slur "gammon" on social media. The South Belfast MP took to Twitter in the early hours of Sunday morning to say she was appalled at the increasing use of the term. "I'm appalled by the term "gammon" now frequently entering the lexicon of so many (mainly on the left) & seemingly be accepted. This is a term based on skin colour & age - stereotyping by colour or age is wrong no matter what race, age or community. It is just wrong," she tweet. The term is normally used as a derogatory slur normally toward white middle class Brexit supporting men whose complexion turns pink when they get over excited about issues such as the UK's impending departure from the EU, immigration matters or political correctness "gone mad". After her tweet the DUP MP was faced with a huge reaction on the social media website with some accusing her of "faux outrage". The prominent left-wing commentator Owen Jones accused the MP of a "ham-fisted" attempt to deflect from the policies of her party highlighting its opposition to gay rights. In turn, Mrs Little Pengelly said the Guardian columnist was "blinded" by his own hatred of the DUP and engaging in "classic whataboutry". "I joined the DUP largely because of its constitutional and economic policies," she responded, "LGBTQ issues are a very small part of the party. i recognise they are of course important to people too, but it does not define the party. "You are dismissing, ridiculously, the entire DUP by that one issue." She added: "How does anyone think it is good idea to have skin colour based insult in 2018? C'mon people. We are all better than that. "We all should be above that." Her original tweet got thousands of interactions. "That certainly divided opinion #gammongate," she added.